NAB President/CEO Gordon Smith, Mayor Muriel Bowser, Congresswoman Eleanor Holmes Norton and other dignitaries turn the first shovelful. Right click images to see enlarged. It’s a gritty street-corner lot, a piece of broken hardtop surrounded by a chain link fence and sitting next to a public storage facility. In two years, it will the site of a shiny new headquarters for the National Association of Broadcasters — perhaps even completed in time for the Major League Baseball All-Star Game that will be played within earshot in July 2018. NAB broke ground for its new HQ Monday in the fast-developing Capitol Riverfront neighborhood of Washington, D.C., not far from the Anacostia River and about 1 mile from the U.S. Capitol, visible from the site. The event was held under a big white tent in hot sunshine, a few hours short of summer solstice, and with construction cranes for other new projects interrupting the backdrop skyline. The association hosted roughly 90 people, including local media, VIPs and numerous members of its board (Dave Lougee, Caroline Beasley, Steve Newberry, Charles Warfield, Paul Tinkle to name a few) who are in town for board meetings as well as NAB’s Celebration of Service to America Awards this week. NAB’s new headquarters will rise where the white tent sits. It moved to its current location on N Street in 1947. This general area, 55 acres in all, had been owned by the federal government; and not long ago most of it was vacant or occupied with derelict buildings. It was considered one of the most valuable pieces of undeveloped property on the East Coast. Congresswoman Eleanor Holmes Norton listed recent developments in the area — not only Nationals Park, now eight years old, but four nearby hotels, 25 restaurants, 15 residential projects, 16 new business buildings, retail shops and parks. District of Columbia Mayor Muriel Bowser received a standing ovation when she arrived, a bit late but in time to welcome NAB with enthusiasm and to participate in the traditional groundbreaking. Bowser said the greater Capitol Riverfront projects will bring more than $1 billion in economic activity, and more than 1,000 full-time jobs. The lot is on the right; parking garages of Nationals Park is visible down the block, and a storage facility currently is at center. Last year NAB had announced it entered into an agreement with Washington-based developer Monument Realty and its investment partners, New York-based Angelo, Gordon & Company. NAB and developers describe the new site as a “gateway” to the booming mixed-use area, which is in the Southeast quadrant of the capital. Not that the current NAB neighborhood is too shabby; Dupont Circle remains a highly desirable part of the city, but getting to and from the Hill has long been a source of frustration to those who had to move back and forth quickly. Smith remembered that “as a member of the Senate Commerce Committee, I went to the NAB once, and swore I’d never go again. And all of you who took the bus over here, you just got a perfect demo of why we need to make this move.” He noted that Washington is an “old colonial town” and the streets are laid out in a way that did not contemplate modern traffic. He said that on Capitol Hill, “You have to be about 15 minutes from a vote, or you really can’t engage with associations or other advocates.” He said as a successful trade association advocating for its industry, it needed to be closer. NAB has said that on closing the purchase in early 2018, it expects to help finance the new project through the sale of its current building at 1771 N Street in the Northwest quadrant. NAB moved there in the late 1940s. Like the current headquarters, the new one will have ready access to the Metro mass transit system. The planned 10-story building will have a curved facade along M Street; a rooftop terrace with a striking Capitol view; and a 100-seat theater. 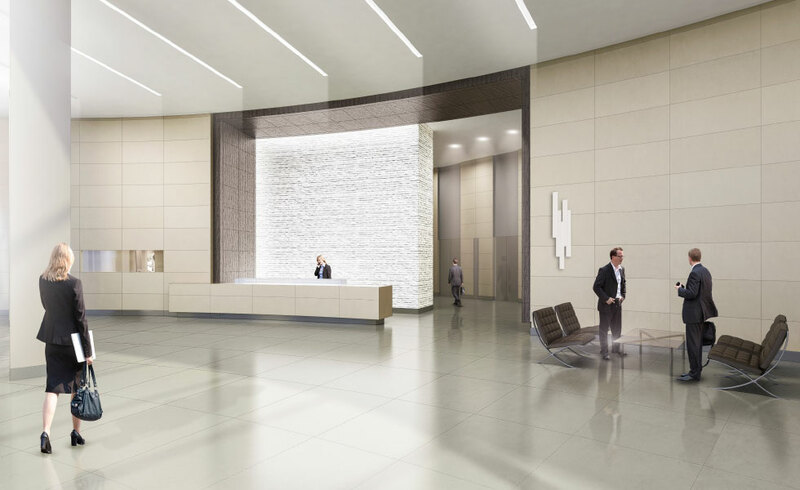 (See a rendering of the lobby.) A new condominium building with residences will be next door. An artist’s rendition of the new building. A Catholic church sits at left; the baseball stadium is down the street to the right. The Capitol would be to the viewer’s left from this perspective, about a mile away. Monument Realty is developer and CBRE’s Nonprofit Practice Group brokered the transaction. HOK is designing the building. Hickok Cole is interiors architect. See more pix below. Del. Eleanor Holmes Norton addresses NAB board members and other VIPs. Visitors to NAB HQ will become familiar with this address.